We interrupt our regularly scheduled blog post to bring you this update. I had a nice post all written up and ready to go, and then yesterday got exciting and the original plan got scrapped. See how flexible I am? I’ll post it sometime this coming week. Yesterday The Kid and I made an impromptu stop at the spice store and I decided to get really creative for the coming year. I got spices that I’ve never tried and plan to give some new creations a go. I got Indian spices, Thai spices, and some other things I’ve not used before. They all smell wonderful. 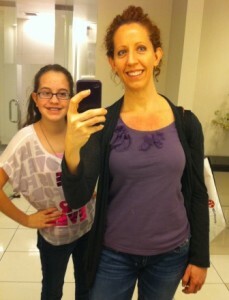 After an eventful shopping trip in which I also got a bunch of stuff at Lululemon (on clearance! ), we headed over to a crazy restaurant. This place is kinda like a cross between the Munster’s Mansion and a Harry Potter type house. Dark, full of books, and quirky things. The waitstaff is dressed up as characters ranging from the obvious of Wonder Woman to obscure of Little Miss Muffett. Our waiter was the Mad Hatter. Not only do they dress up, but they also have to act as the character the entire time. It can get kind of irritating after a while depending on which character you get. Ie, Mad Hatter speaking in rhymes is a freaking pain. This is where it got really exciting. I ordered steak but it came with… OMG… bacon wrapped shrimp! BACON.wrapped.shrimp! These were just your typical shrimp with a strip of bacon wrapped around each one and then baked. No sauce, no nothing. The perfect combination. I’ve never ever heard of anything like it, but oof were they good. I filled up on salad bar, veggies, and 4 delicious bacon wrapped shrimp. I’ve now got the ingredients on my list to try some weekend. I actually want them tonight, but I promised myself I wouldn’t have them again just yet. Plus I really don’t think bacon is approved on the Whole30 challenge because of the processing of it. Bacon is paleo though so it wasn’t a complete fail. I’ll leave you with a final recipe for the old year. I loved these veggies and have leftovers for today’s lunch. They weren’t too spicy from the curry paste, but just spicy enough for flavor. 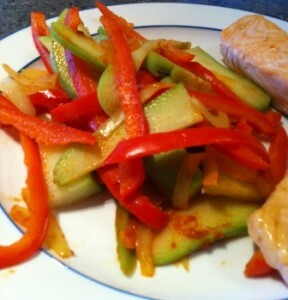 Slice the onion, pepper, and chayote squash into strips of about the same size. Make sure to remove the seed in the middle of the squash. Heat oil in a pan over medium heat. Add veggies and saute for about 7 minutes, stirring often, until they are tender and softened. 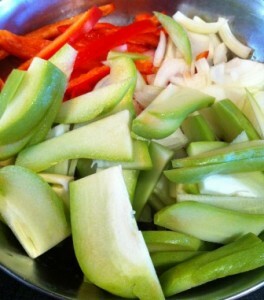 Add the red curry paste and stir to coat the veggies with it. Serves about 4 (or 2 if you get carried away like we did). I usually make these with sliced mushrooms too, but I used a smaller pan and didn’t have enough room this time. You can use red, yellow, or orange peppers for different colors. All are good combinations. I haven’t tried this with the green curry paste, but that might also work. What is your favorite curry paste – red or green? Do you have a favorite spice? Have you tried bacon wrapped shrimp?! Happy New Year’s Eve and please be safe out there.